As we start mentioning some of the new collections inside the fashion planet then we never forget out mentioning all about the Evolve party wear collection 2013 for women. This collection is actually becoming the center of attraction just like rest of other branded collections. 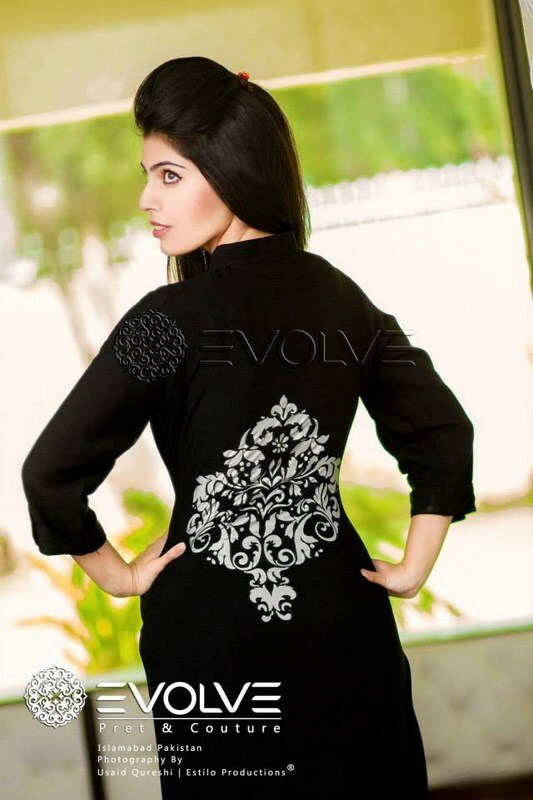 Evolve is one of the newly emerging fashion houses in Pakistan. This brand hub has been set up in 2013 in Islamabad. Evolve has been known as one of the best brands for the women clothing collections that travel inside the categories of the formal wear, semi formal wear, causal wear plus the party wear as well. Evolve has been known best for highlighting the traditional and modern flavors in their collections that is quite one of the attention grabbing features in the collection. Although this brand has even seen in the seasonal timings too but without any doubt Evolve has made titanic success in just minimum time scale. Recently, Evolve has revealed out their classy stylish and elegant designed party wear collection 2013 for women. This party wear collection 2013 has been captured as filled with the long shirts. All the long shirts in this collection can be ideally worn up with the tights, trousers and churidaar pajamas. In addition to all such clothing this party wear collection is even offering the tops as well that are shared with the tights and churidaar pajamas. In this way this collection has been offering the mixture blend of both the western and eastern flavors. The party dresses have been stunningly decorated with the embroidery plus the lace working and little motif versions as well. In this post we will be sharing some of the pictures about Evolve party wear collection 2013 for women. The collection photo shoot is featuring the model Shermeen Wyne and the cinematography has been covered by Estilo Productions. Hence this party wear collection by Evolve is simply brilliant and out of this world fabulous looking for the women.